Consider an application where a human user has to digitally sign a message. It is usually assumed that she has a trusted computer at her disposal, however, this assumption does not hold in several practical cases, especially if the user is mobile. Smart cards have been proposed to solve this problem, but they do not have a user interface, therefore the user still needs a (potentially untrusted) terminal to authorize the card to produce digital signatures. In order to mitigate this problem, we proposed a solution based on conditional signatures to provide a framework for the repudiation of unintended signatures. Our previous solution relies on a trusted third party who is able to link the issuer of the signature with the intended recipient, which may lead to severe privacy problems. In this paper we extend our framework and propose protocols that allow the user to retain her privacy with respect to this trusted third party. Rivest, R (2001). Issues in Cryptography. Computers, Freedom, Privacy 2001 Conference http://theory.lcs.mit.edu/~rivest/Rivest-IssuessInCryptography.pdf. Schneier, B. and Shostack, A. (1999). 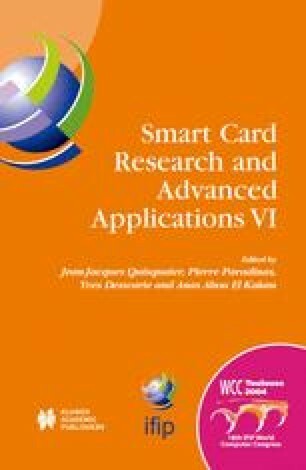 Breaking up is Hard to do: Modelling security threats for smart cards. USENIX Workshop on Smart Card Technology, Chicago, Illinois, USA, http://www.counterpane.com/smart-card-threats.html. Schneier, Bruce (1999). The Solitaire Encryption Algorithm. http://www.counterpane.com/solitaire.htm.